Pakistan established their own cricket league, to compete with their neighbors (Indian Premier League and Bangladesh Premier League). PSL announced in 2016, its first edition played in UAE, there is 6% hike in the prize money of super league after the 2nd edition. PSL 2nd edition is far better then previous one. Pakistan brings cricket back to their home as the final match played in Lahore. Note: The prize money in the above table is estimated, there is no official announcement yet made by the PCB officials about the increase. Rumors on-going that the PSL 2018 winning team will bag ($1 million). The team who lost the final will received $700,000. There is bit increase in the man of the match award cash prize (man of the match) player will now earn $6,000. 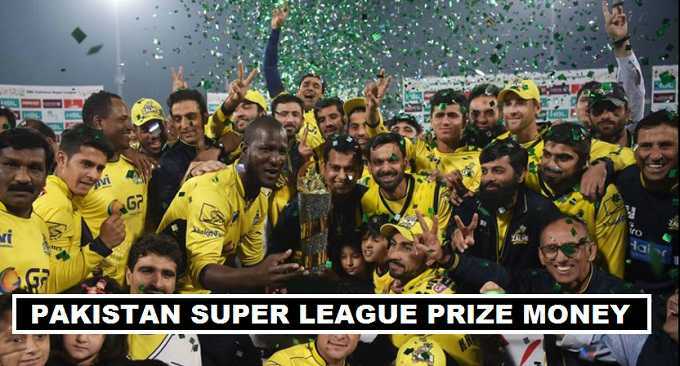 No-doubt that international cricketers interested to play in Pakistan Super League. PCB looking to make a good increase in the prize money so that more players attracted towards the league. The officials are trying hard to do all the matches of PSL this year in Pakistan. But it looks difficult due to security issues. Najam Sethi the new chairman PCB brings couple of changes to Pakistan cricket board. Now there are six franchise that will play the next PSL tournament. Multan Sultans become the new competitors for the third edition of PSL. Which means there will be 34 matches in the upcoming season of the league. People living in other countries taking interest in the PSL matches and supporting their favorite team. More channels were looking to get rights to show the coverage of PSL in their territories.